New Communities Minister, Malcolm Chisholm, has been urged to ensure, as his first priority, that no homeless child in Scotland will spend this Christmas in Bed and Breakfast accommodation. 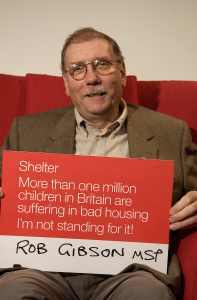 The call comes as Shelter joins forces with the moderator of the General Assembly of the Church of Scotland to highlight the plight of over a million children in Britain suffering in bad housing. 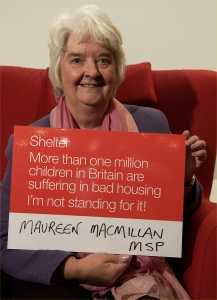 Former Minister Margaret Curran pledged, last December, to end the scandal of children living in B&Bs by this Christmas. But regulations to ban the use of B&Bs for families are still not in place. Families housed in expensive B&B accommodation often live in one room, with no access to cooking or private bathroom facilities. The effects on children living in these conditions, even in the short term, can be profound. Children in B&Bs are twice as likely to be admitted to A&E with burns and scalds because of the conditions they live in. The clock is ticking to meet the Executive's own deadline and Shelter is calling on Malcolm Chisholm to use this opportunity to demonstrate his commitment to end the use of B&Bs for homeless children this Christmas, before it is too late. Dr Alison Elliott, moderator of the General Assembly of the Church of Scotland said: "A home isn't just for Christmas but it's at Christmas that the plight of homeless children makes a special impact on our sense of decency. I hope that the minister will make good his predecessor's pledge not to use B&Bs to house children at Christmas or any other time of the year." Liz Nicholson, Director of Shelter Scotland said: "No child in 21st Century Scotland should suffer the indignity of living in B&B accommodation.. Even in an emergency, seven days is the longest any child should be forced to live in these conditions - anything longer will be a loophole that effectively means B&Bs are not banned at all. The minister can really make his mark by backing the pledge made by his predecessor. But Christmas is getting close, so he must act now to make sure that not one more homeless child has to spend the festive season in a B&B." Highlands and Islands MSPs Rob Gibson, Maureen Macmillan and Eleanor Scott have joined Shelter's red chair 'sit-in', to show their support for the charity's campaign to end the scandal of the over one million in children in Britain who are suffering in bad housing. The red chair arrived at the Parliament's new home at Holyrood last Wednesday as part of a UK-wide tour, which includes visits to Edinburgh, Glasgow, Dundee and Stirling.The MSPs join thousands of members of the public across the UK who are having their photo taken in a red chair to show their support for the campaign. The portraits will appear on the Shelter online gallery at www.shelter.org.uk/sit-in and in a major gallery exhibition in the new year. Since the million children campaign launched in April, nearly 15,000 people have signed up and registered their protest. Liz Nicholson, Director of Shelter Scotland, says: "In Britain over a million children are suffering in damp and dangerous homes, living in fear of eviction and debt, and some have lost their homes already. In Highland alone, the number of children in temporary accommodation has risen 34% in the last year1. We're delighted that Rob Gibson, Maureen Macmillan and Eleanor Scott have shown their support for our million children campaign in the Parliament's new, permanent home and are playing their part in standing up for Scotland's badly housed children." Rob Gibson MSP says: "To have one Scottish child living in poverty is unacceptable, but to have thousands is scandalous. The Scottish Executive pledged that every child in Scotland should be given the best possible start in life, that for me means ending child poverty whether it be in Wick or Wigton and I hope that this campaign will go some way to highlighting and eradicating the problem." 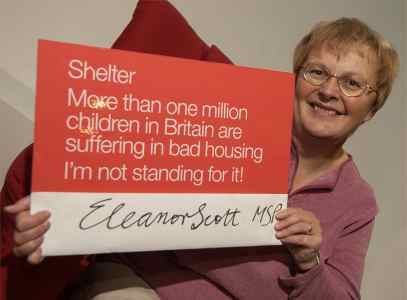 Eleanor Scott MSP says: "I am pleased to be supporting Shelter's campaign. Housing problems are often thought of as belonging to our inner cities but as an MSP for Highlands and Islands I am well aware of the housing problems in rural areas, where we see families living in substandard accommodation, mobile homes or unsatisfactory temporary rented housing. Clearly this has a detrimental effect on children's health, wellbeing and education and in 21st century Scotland this is simply unacceptable." Shelter launched its million children campaign in April with the publication of Toying with their future, which revealed for the first time that over a million children in Britain are growing up in overcrowded, poor quality or emergency housing, and are suffering from serious health problems, poor education and blighted futures. The charity is now calling on the Scottish Executive to commit to ending bad housing for the next generation of children. Members of the public can join the Shelter 'sit-in' protest by submitting a photo of themselves in a red chair online at www.shelter.org.uk . Shelter believes everyone should have a home and helps 100,000 people a year fight for their rights, get back on their feet, and find and keep a home. We also tackle the root causes of Britain's housing crisis by campaigning for new laws, policies and solutions. 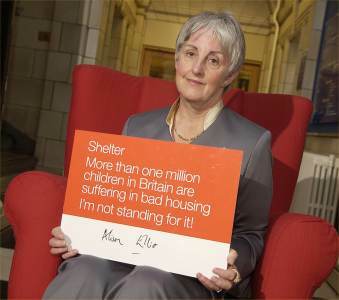 Shelter launched the Million Children Campaign in April 2004 aimed at getting government to commit to ending bad housing for the next generation of children. Shelter runs Shelterline, supported by Bradford & Bingley, the UK's free national housing advice line on 0808 800 4444, and provides advice online at www.shelter.org.uk/adviceonline .